There was agreement from Hardknott's Dave Bailey regarding the impact on his business. 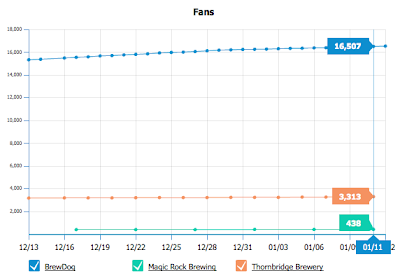 In a future post, I'm going to look at this impact in more detail but in today's post, I'm going to turn my attention to the behemoth of a social media network that is Facebook, using the same three breweries' fan pages. The depth and reach of Facebook far exceeds that of Twitter, with this BBC article suggesting 10% of the population has an account. This was driven home to me recently when I received a friend request from my mother! Facebook clearly works very differently to Twitter on many levels, but fundamentally the principles are the same for a business wishing to reach out to and engage with consumers. Facebook provides private and business users with the ability to create 'fan' pages. Users can then 'like' these pages and the updates the creator (and optionally others) post to them will then appear in their 'news feed'. Users can comment on and 'like' posts to these pages to engage with the creator and other 'fans'. 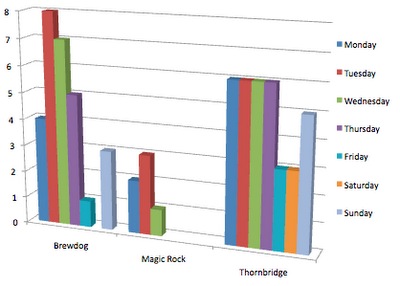 So BrewDog posted 28 times, Magic Rock 6 times and Thornbridge 35 times in that 12 day period. Thornbridge, as observed in the previous post, usually posts exactly three times per day during the week. 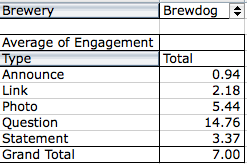 BrewDog vary their posting rate and Magic Rock seem to prefer Twitter to Facebook. [34.4, Question] What would you most like to see 1) A BrewDog Lambic? 2) Nara on Twitter 3) A Triple IPA 4) A Grandiloquent Fox? 5) A BrewDog Scotch Whisky? [16.1, Question] What are you drinking tonight? [0.3, Statement] Well would you look at that, we're also on Twitter AND Google+. You know what to do. [19.3, Question] Do you prefer the traditional interior or a modern finish in a local pub? [19.0, Statement] We started the week brewing Jaipur. We're sure many of you will approve! [17.8, Question] The price of beer is.....? [0.3, Statement] The winds are still going strong watch out out there! Perhaps finding that links lead to the least engagement is not surprising as Facebook users may simply click on them rather than comment and/or like. 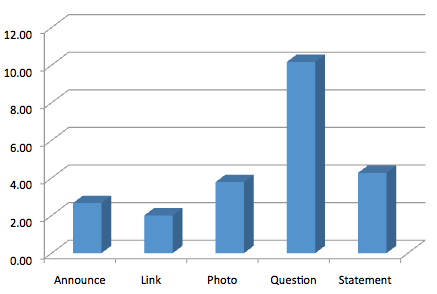 It's clear though that asking 'fans' questions is what really drives engagement which makes perfect sense. How do you engage with breweries on Facebook? Do you prefer engaging via Facebook or Twitter? 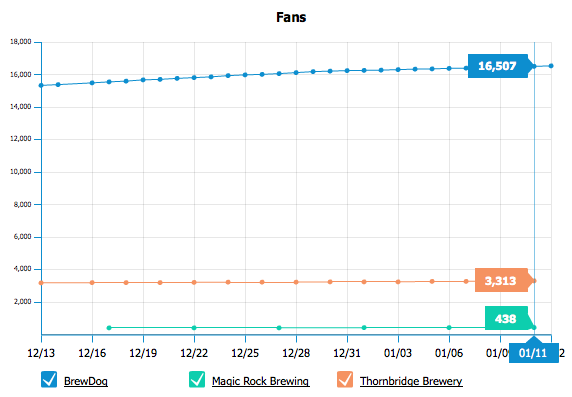 If you're a brewery, how much importance do you attach to each and does this impact the effort you put into the respective social networks? 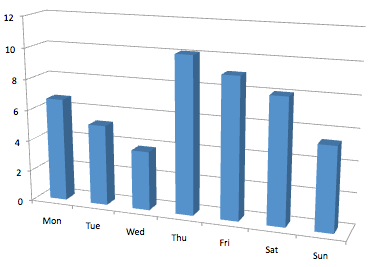 If anyone's interested in the raw data (I can't be the only one who loves a good pivot table! 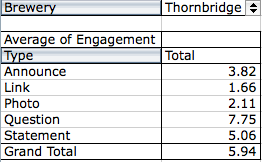 ), I'd be happy to email the excel spreadsheet.